This recipe is brought to you by Sabra. A few months ago, Connor and I went out to dinner at Avec, one of my favorite restaurants in Chicago, and had one of the best (and most unexpected) hummus appetizers of my life. 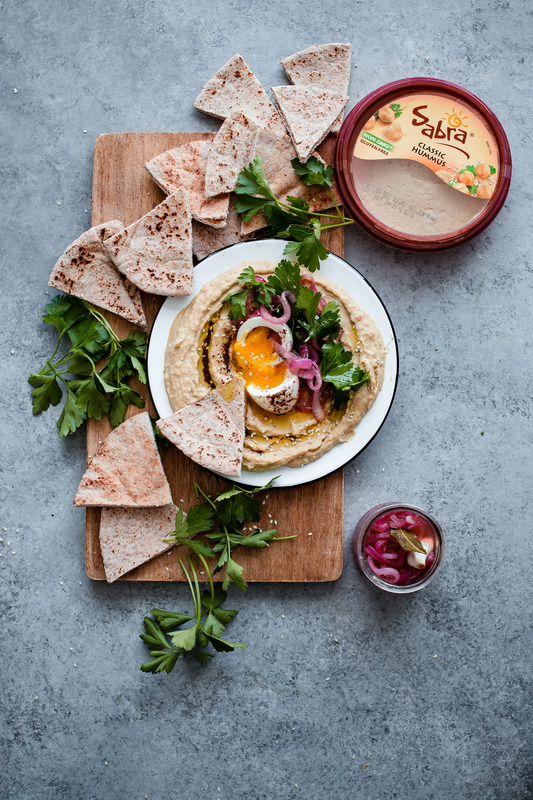 Silky smooth hummus topped with pink pickled onions, a perfectly cooked soft-boiled egg, flat leaf parsley, and a smoky chili oil. As soon as we cut into the egg, the runny yolk spilled into a beautiful pool onto the hummus, bringing the whole dish together. We happily ate away, dipping and scooping up all of the flavors onto our warm, oven-baked pita bread until the plate was clean. It was my first time having hummus topped with an egg (let alone, a soft-boiled egg) and somehow the combination just worked. After doing a bit of research, I actually discovered that egg is a traditional accompaniment to hummus in many cultures. The soft-boiled egg made for an incredibly satiating and flavor-packed appetizer that elevated traditional hummus, which we all know and love, to an entirely different level. I vowed right then and there to try my best to recreate a similar version of this dish to share with you, and that is what we’re doing today. 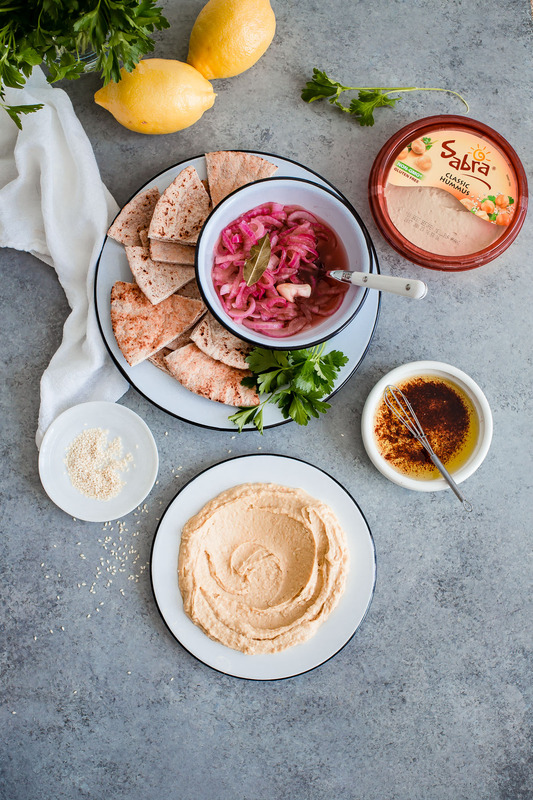 I partnered with my friends at Sabra to bring you a more time-friendly version of this dish just in time for National Hummus Day (May 13th). While I’m the first to poke fun at national food holidays, I love any and all excuses to celebrate food. 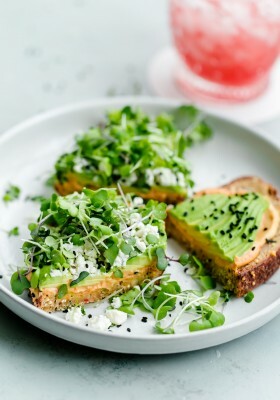 Last year, I was all about the spicy hummus avocado toast (so spicy!). This year, I’m for hummus with all the toppings. The convenience of store-bought hummus allowed me to throw this vegetarian appetizer together in about fifteen minutes (minus pickling time). My version uses Sabra’s classic hummus (gluten-free and non-GMO), which acts as a blank canvas to all of the other flavors in this dish. This is the type of appetizer that can almost serve as a meal unto itself. You’ve got it all: nutritious plant-based proteins, fiber, and fat all in a single dish. An unofficial meal, if you will. Perfect for busy weekday nights when you get home starving and don’t have the energy to stand over the stove, but elegant enough to serve at get-togethers or family gatherings. The most time-intensive (if you can even call it that!) 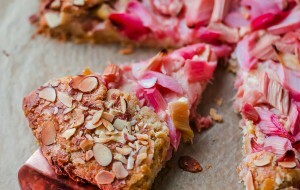 step of this recipe is the pickled red onion. The pickling liquid, a simple combination of everyday ingredients: red wine vinegar, sugar, salt, and spices. They are briefly simmered on the stove and poured over thinly sliced red onion. In order to give the onion enough time to soften and absorb the pickling liquid, you’ll want to prepare these several hours in advance or preferably, a day or two before. 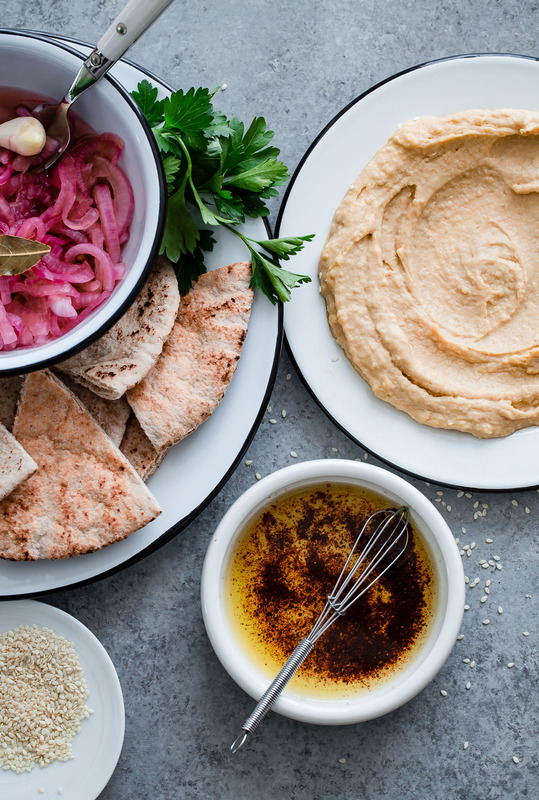 Since it takes the exact same amount of time to prepare 2 cups vs. a tiny spoonful of pickled onions, the pickled onion recipe below makes more than you’ll need for this hummus platter. It’s basically built-in food prep. This is a very good thing! Use the leftovers on everything from tacos and sandwiches to salads and everything in between. 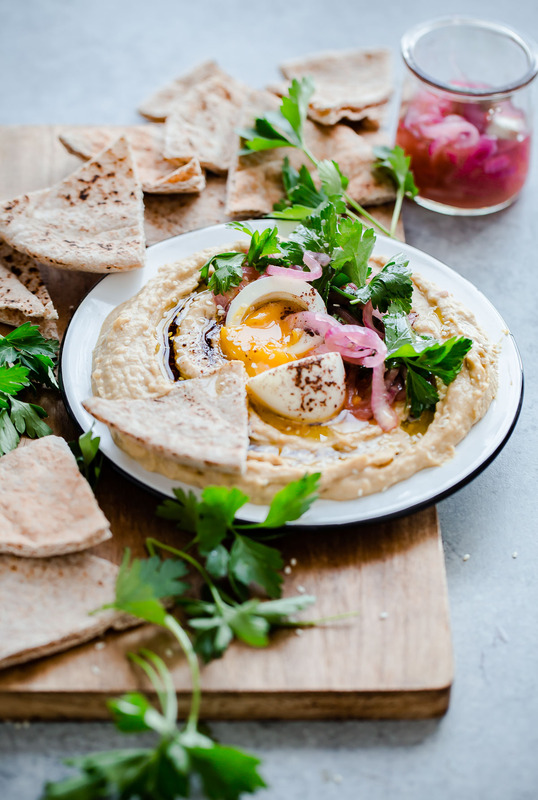 Once you’ve topped the hummus with the egg, parsley, and pickled onion, the whole thing is topped off with sumac oil, a simple combination of high-quality olive oil (the fruitier, the better!) and ground sumac. I’m having a moment with sumac (remember this Mediterranean chicken salad?). It adds a tart, lemon-like punch of flavor and brightness to this hummus appetizer, and helps bring this dish together. If you can’t find ground sumac – I can usually find it at Middle Eastern markets or order it online – you can substitute it with ground paprika and fresh lemon zest for an alternative and equally as good preparation. Don’t forget the warm or lightly baked pita bread for serving! You’ll want a scooping vehicle to soak up all of those delicious flavors and textures. Several hours ahead or the day before, prepare the pickled red onions: Place the red onions and garlic in a tall heatproof container, and set aside. Combine the vinegar, sugar, salt, peppercorns, and bay leaf in a small saucepan. Bring to a boil, reduce heat, and simmer for 20 to 30 seconds until the sugar has completely dissolved. Pour the hot pickling liquid over the red onions and stir to container. The onions should be completely submerged in the pickled liquid (if necessary, use a large spoon to press them down). Pickle for at least two hours or preferably, overnight in the refrigerator. Whisk together the olive oil and sumac in a small bowl, and set aside. Cook the soft-boiled egg: set a timer for 6 minutes. Set aside a small ice bath bowl. Bring a small saucepan of cold water to a low simmer. Gently lower the egg into the simmering water and start the timer (cook for 6 minutes). Immediately transfer the egg to the ice water water, and allow it to sit until cool enough to handle. Carefully peel and set aside on a paper-toweled lined plate until ready to serve. Spoon and spread the hummus into a shallow bowl or plate. Top with a small bunch of flat leaf parsley, spoonful of pickled red onion, and the egg (right before serving, cut in half to break the yolk). Spoon the sumac oil over the egg, parsley, and hummus. Sprinkle with sesame seeds, if desired. 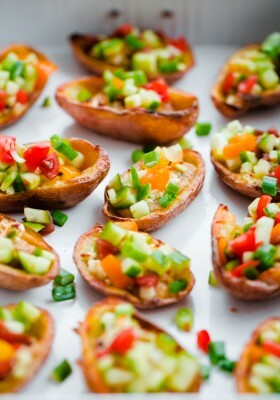 Serve immediately with warmed or toasted pita wedges for dipping. Pickled onions should be stored in their liquid in the fridge for up to 5 days. If you can’t find ground sumac, you can substitute it with ground paprika and a small amount of freshly grated lemon zest’s good alternative. 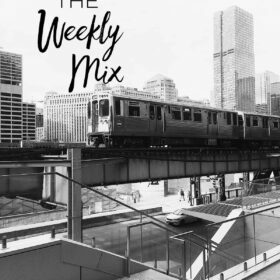 I am proud to be a member of the Sabra Tastemaker program! This recipe post is sponsored by Sabra. Thank you for supporting brands that allow me to get in the kitchen, be creative, and share my passion for great food! This sounds absolutely heavenly! I never knew the throw in a soft boiled egg in hummus. Can’t wait to try. This sounds delicious and fascinating. I never thought of having an egg on hummus. The pickled onions sound delicious too. I would definitely make them for other recipes also. Thanks for sharing! WOW! 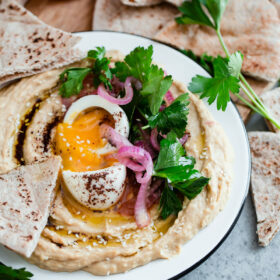 I am loving the idea of topping hummus with a soft boiled egg. Sounds and looks SO yummy. 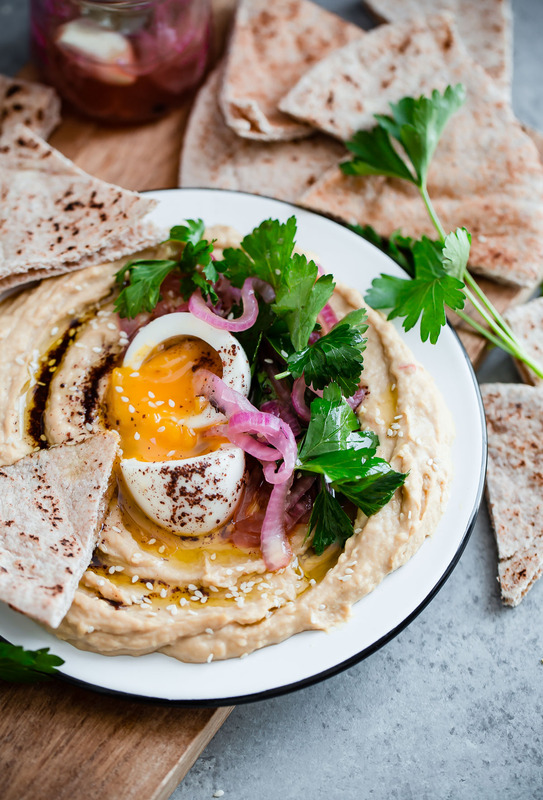 This might be the most beautiful hummus dish ever… THAT EGG!! Beyond gorgeous (per usual) and thank you for opening my mind to the idea of a soft boiled egg ON HUMMUS. Never would’ve thought of that and I’m in love. Trying asap! I am just about to prepare my pickled onions, so they can sit in the fridge for a day or two. 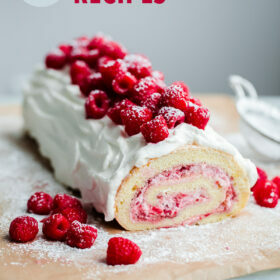 So excited to make this!